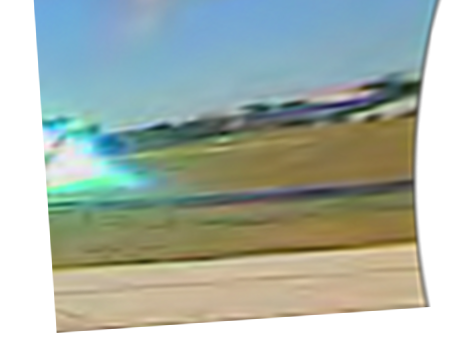 In March, 2002 five frames from one video camera were released (leaked?) 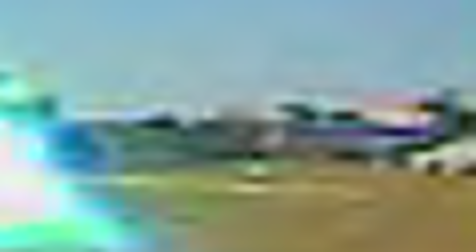 as small bmp images that purportedly showed the Pentagon plane. It had an erroneous time stamp (added later it turns out; not in the original), lack of context, small image size, and it did more to sow confusion than shed light on what hit the Pentagon. 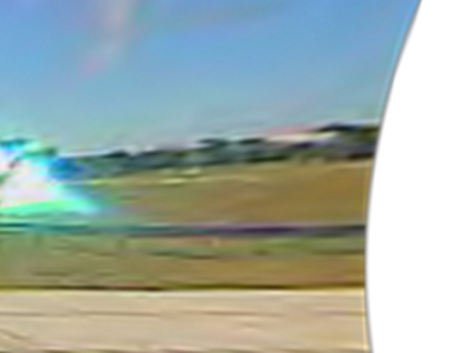 Here is the first frame of that set just before impact, together with a zoomed detail view. 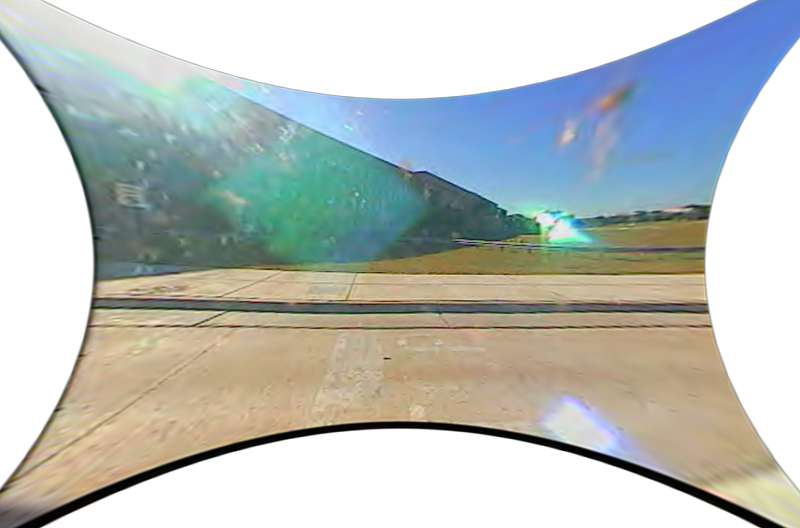 This view does a blink comparison between the frames from Camera 1 and Camera 2 that contain the plane. The motion of the plane between these two views is apparent. This establishes that the two cameras were out of synch by a fraction of a second. 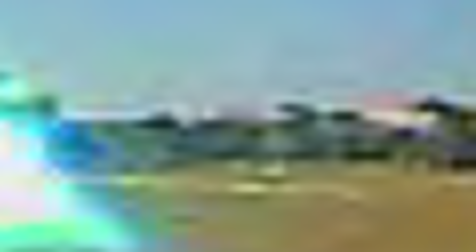 This view blinks the full image from Camera 1. 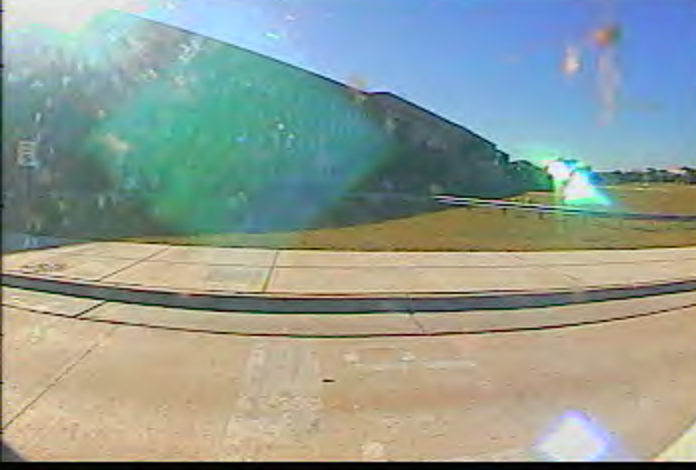 This view blinks the full image from Camera 2. The low contrast between the backlit plane and the complex background. 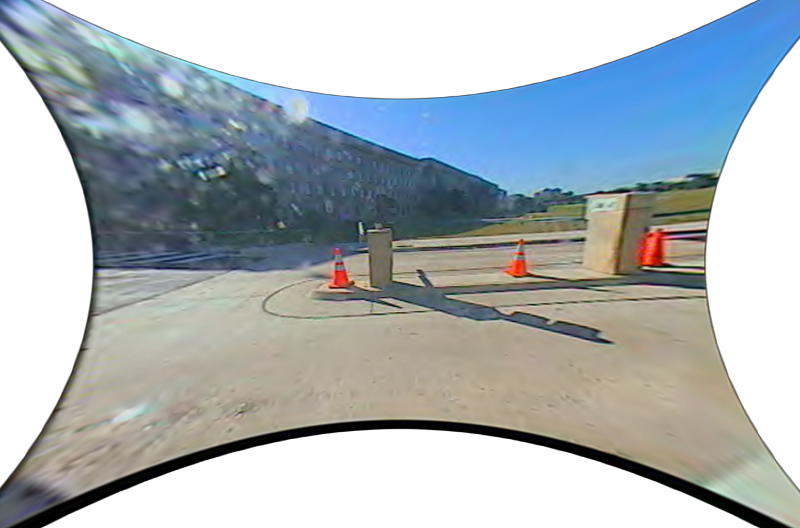 The extreme wide angle lens and low resolution of the video camera/recorder. Some blurring due to the motion of the fast moving plane. The small scale, low quality images that have circulated on the internet. Blink comparators are commonly used to detect subtle differences between pairs of astronomical photographs. Variable stars show up as blinking lights. Asteroids move from night to night, even from hour to hour, so they appear to jump back and forth when blinked. Blinking two frames can also make a low contrast object stand out against a noisy background. 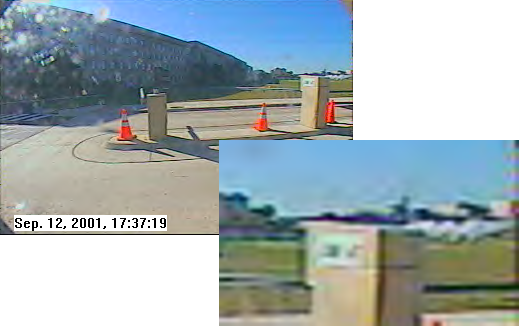 This technique, applied to the security camera frames, allows the eye to more easily discern the presence of a plane, allowing it to pop out from the background each time it flashes into view. A number of image processing programs, such as GIMP (which is what I used), have functions to compensate for lens distortion. 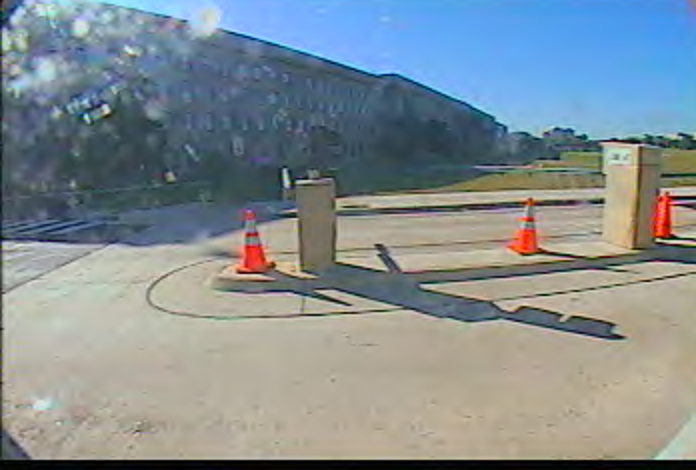 Note that in the full views shown above, straight lines, such as the curbs, lines in the side walk, the roof of the Pentagon, etc., are bowed outward by the lens, an effect called barrel distortion. The parameters of the lens correction function can be varied until the curves become straight. This results in a "pincushion" distortion (inward bowing) that cancels the barrel distortion. In GIMP this is a manual process, using a slider to adjust the amount of distortion. This view cancels the barrel distortion of Camera 1. This view cancels the barrel distortion of Camera 2. Note that the process that cancels the barrel distortion of the image introduces a pincushion distortion of the rectangular frame. This is a zoomed and cropped view from Camera 1. 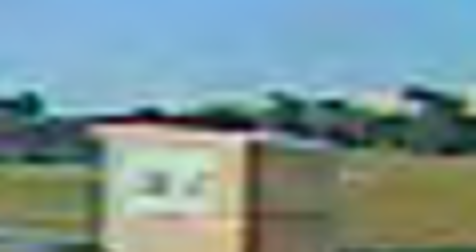 This is a zoomed and cropped view from Camera 2. One feature of the plane image helps us identify it as an American Airlines plane. Note the purple stripe along the side of the plane. American Airlines planes have parallel red and blue stripes. At the small scale of the original image it is quite likely that this purple stripe is a merger of the color information from a red and a blue stripe. NEW: Wayne Coste's analysis of the security camera videos extends what I have shown on this page. The blink comparator images below establish that a large plane approached the Pentagon. 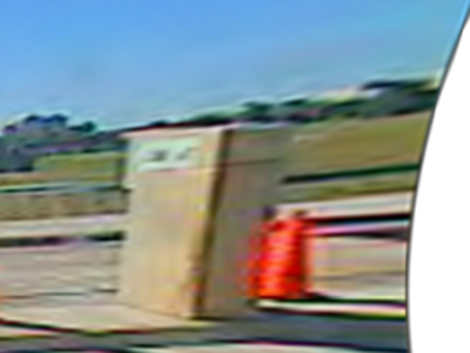 Wayne's analysis supports the authenticity of the videos and provides an independent assessment of the speed of the plane based on the security camera footage.